The "Financial projections" worksheet is intended for the generation of various financial statements and performance ratios. NB! Financial statements and performance ratios are output from iPlanner's financial engine, calculated by model input. Thus, if you want to change financial projections or -ratios, you need to change the input. This can be done on various worksheets like "Revenue", "Expenses", "Assets" and "Funding". 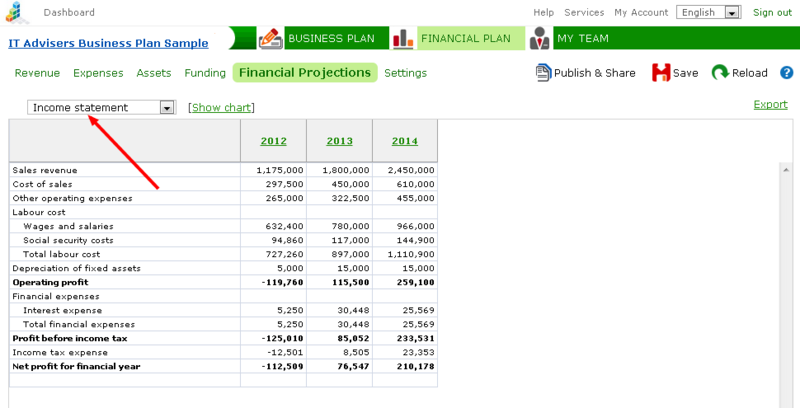 To generate a financial projection, select a desired output from the drop-down menu.